For many years, invasive angiography was considered the gold standard for the assessment of aortic abnormalities. However, the complexities and complications inherent to invasive imaging have meant that more recently non-invasive techniques such as echocardiography, magnetic resonance imaging (MRI) and multidetector computed tomography (MDCT) have been increasingly used to assess cardiovascular disorders. 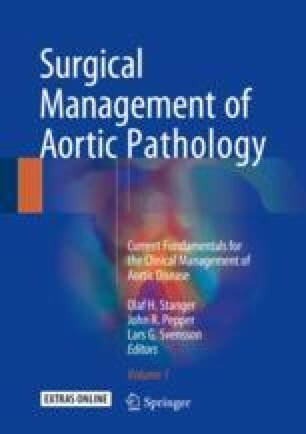 In particular, MDCT has emerged as a fundamental tool for the diagnosis and pre-surgical work-up of many aortic pathologies due to its high spatial resolution, large area of coverage and short scan time; as a result it is now one of the most widely used modalities for the detection of abnormalities of the aorta. The purpose of this chapter is to review the spectrum of aortic conditions—both acquired and congenital—that can be detected by MDCT, with particular attention to the anatomical and imaging features of aortic disease.